If blonde is great, BLONDER is better. Especially when you’re enhancing your golden strands with an ultra-high-lift formula that safely kicks you up to 9+ levels in record time. ** With our powerful conditioning formula, you’ll steer clear of those damaging multiple applications, reduce breakage*** and bypass the hassle of additives. Use with foils...without foils... Blonde Life Lightening Powder gets you blonde safely and in a flash. ***Against combing breakage on damaged hair; when used with Joico Blonde Life Brightening Masque vs. a non-conditioning bleach. (1:1 or 1:2) 1 scoop of Blonde Life Lightening Powder with 1 or 2 oz of 10 (3%), 20 (6%), 30 (9%) or 40 (12%) Volume Veroxide® or LumiShine® Crème Developer. On-Scalp: Mix (1:2) 1 scoop of Blonde Life Lightening Powder with 2 oz of 10 (3%) or 20 (6%) Volume Veroxide or LumiShine Crème Developer. DO NOT USE 30 (9%) or 40 (12%) Volume for on ON-SCALP mixtures. Processing: Process up to 60 minutes without heat; rinse, then shampoo with Blonde Life Brightening Shampoo and follow with Blonde Life Brightening Masque. 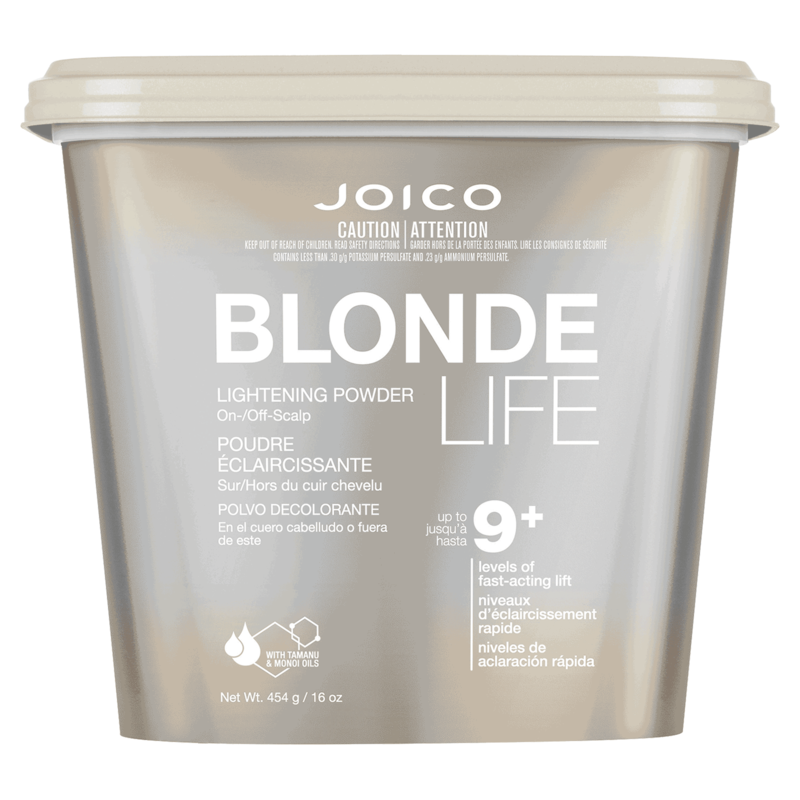 Joico Blonde Life Lightening Powderis perfect for highlights, on-scalp lightening, for extreme lifting and quick lift. - The quickest* way to brighten and lighten hair! * vs. other Joico lighteners. ** Against combing breakage on damaged hair; when used with Joico Blonde Life Brightening Masque vs. a non-conditioning bleach. To give blondes the VIP treatment they deserve and demand, we traveled far and wide to find the most nourishing natural oils and teamed them with our most powerful hair healers. MONOI OIL: Rich in essential fatty acids, this exotic blend of Coconut Oil and Tahitian Gardenia Flower Extract nourishes and protects each strand, working from the inside out to replace essential moisture and help preserve hairs softness and elasticity. TAMANU OIL: Packed with essential fatty acids and Omega-6 and -9, this rare oil from Southeast Asia helps protect hair and bump up shine. "We've been an Aveda concept salon since 1999 & actually love the Blonde Life powder lightener, shampoo & conditioners over Aveda's Enlightener & Blue Malva products (which are not even available for backbar use anymore)." "Great lightner. Pulls cool and very even. Does not expland in the foil. You can see the color of lift through the product. Inexpensive which is a plus. Only down side is it has a terrible smell but most lightners don't smell very good."